Aswan is situated 900 kilometers south of the capital, Cairo, and many of the great temples of the Pharaohs are easily accessible from Aswan. These include the Temple of Isis on Philae Island, the Temples of Horus and Sokaris at KomOmbo, the Temple of Horus at Edfu, and the Temples of Rameses II and Nefertari at Abu Simbel. 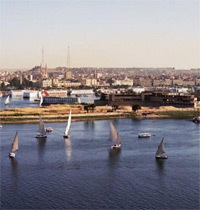 Other places of interest are the High Dam, Unfinished Obelisk, Elephantine Island and the Botanical Garden. A cruise on the River Nile in a felucca or motor boat is also very popular, particularly through the remains of the First Cataract of the Nile which was greatly changed by the construction of the first Dam at Aswan, built by the British circa 1890. The area is also famous for sand baths which utilize sand from the Libyan Desert, and is considered as a therapeutic treatment for many ailments. A popular afternoon trip by caleche is to the Tabia Mosque, which was built by Suliman Pasha and is similar in design to the Mosque of Mohamed Ali in Cairo.